It's five o'clock on a Wednesday night. It's dark, icy, sub 20 degrees outside (with a wind chill it feels like zero), and you still haven't done your run for the day. You weigh your options: run on the treadmill or enjoy a glass of pinot noir and a warm bowl of soup while sitting on the couch. Easy choice, right? Get on the treadmill! 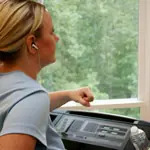 Running on a treadmill is obviously not the same as running outdoors but there are a few ways to compensate for missing elements and still have a satisfying workout. Depending on your speed, outside air resistance increases your running workload between two and 10 percent. Simulate that resistance by setting the treadmill incline at one to two percent. Running on a treadmill lets you run without as much reliance on proprioception. Your neuromuscular system doesn't have to make corrections for varying terrain that affects muscles and joints. This allows you to pay closer attention to body mechanics and good form. Some runners feel less stable while running on a moving belt which can result in uneven strides. The support leg often remains on the "ground" longer which decreases efficiency. Try to maintain a count of 85-95 steps per minute to avoid an uneven stride. Add a little spice to your typical treadmill routine with the following workouts. After a 10 minute warm-up, set the treadmill pace at 45 seconds/mile slower than your average 10K pace. Follow the chart for changes in the incline. To make this more difficult, simply increase the pace or the time at different inclines. The beauty of the treadmill is your ability to control pace and incline. Following a 10 minute warm-up at 0-1 percent incline, do two sets of 3 x 2 minutes at your average 5K race pace. Increase the incline for each interval such that interval one is at an incline of two percent, interval two at three percent and interval three at four to five percent. Repeat for the second set. Give yourself a two-minute recovery of easy jogging between intervals. Another simple way to mix up a normal treadmill run is to simulate a fartlek using your own music as a cue. For example, every time you hear the chorus during a song, pick up the pace for 30 seconds. Next time you are faced with harsh weather outside and the temptation of a warm meal on the couch in the comfort of your own home, think twice. That scrumptious supper on the couch will still be waiting for you after a satisfying workout on the treadmill.